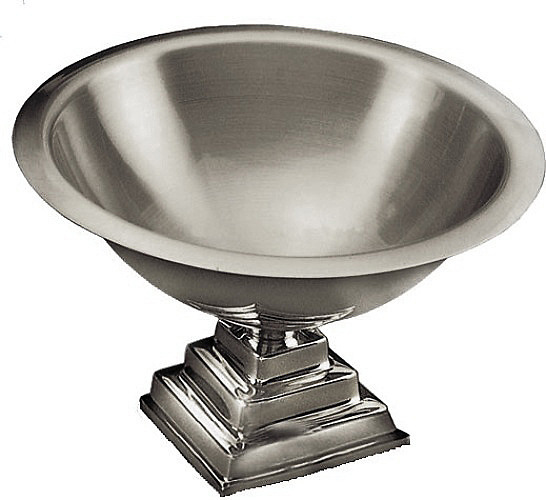 Inspiration and talent have combined to produce this silvertone large baptism bowl with square base. Stately in design, functional, attractive, and exquisite in craftsmanship, this Bowl is styled to reflect the dignity of the occasion. Protected with clear urethane finish; liner recommended, and included. Bowl is 9” in diameter, 4 1/8” high, 2 lbs., 36 oz. Matching cover - 659830401510 sold separately.